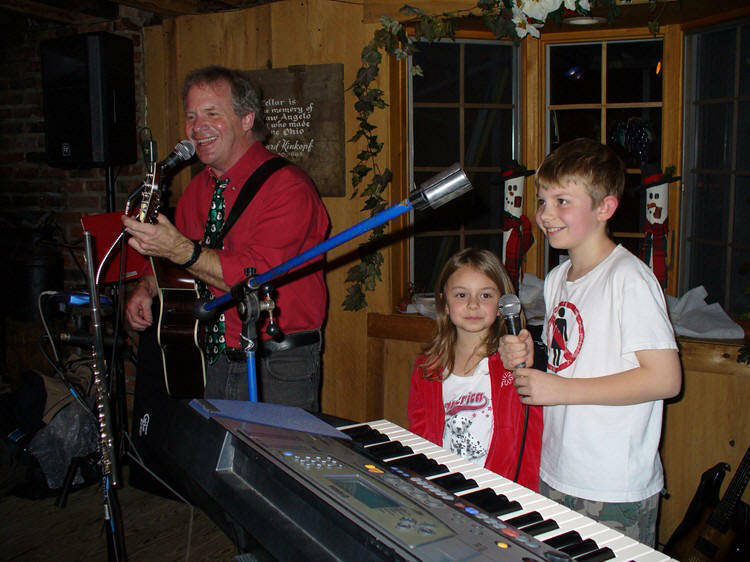 Tom Todd has been performing at elementary, middle and high schools for over 10 years, mainly in Ohio and surrounding states. 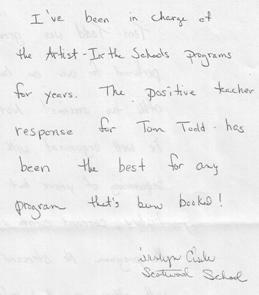 His programs are high energy, fun for students and teachers alike, and have educational value, too! The programs are usually about 1 hour in length, designed for auditoriums or gymnasiums. Tom provides his own sound system. It is a very professional presentation all the way. 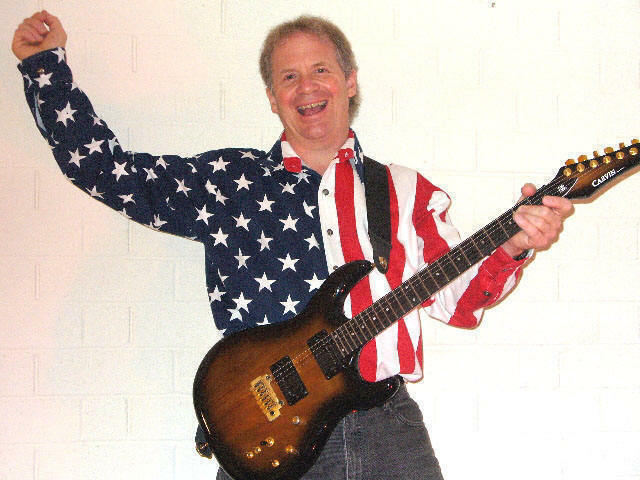 Tom plays music from all eras of American history. From YANKEE DOODLE to BORN IN THE USA, each song has a story behind it. Several instruments are featured. For example: OH! SUSANNA (banjo), BATTLE HYMN OF THE REPUBLIC (trumpet), DIXIE (flute), etc. 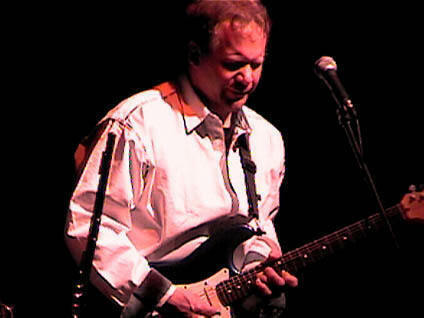 (also trombone, saxophone, harmonica, folk guitar) Tom includes several modern rock tunes on the electric guitar! It's PATRIOTIC, and it's a history lesson the students will never forget! Grades 4th - 12th. 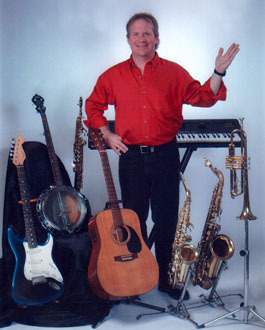 Tom plays TEN DIFFERENT MUSICAL INSTRUMENTS, performing popular songs the children can recognize and identify with. Hear him play "Yakkety Sax" on the saxophone, "76 Trombones" on the slide trombone, "Dueling Banjos" on the banjo, then roar into a rockin' version of "All Star" or "I'm a Believer" on electric guitar! It's a high-energy show, with lots of audience participation and sing-alongs. It's also (shh, don't tell the kids!) educational. Tom demonstrates: How the instruments work, what creates the sound, how the notes change. He uses brass, wind, and string instruments. He also shows, via a synthesizer, how an entire song can be created, letting the children hear how the different instruments are 'layered' together to create the complete sound of a popular tune. Volunteers from the audience can come up on stage and try a few of the instruments. Featured Instruments: Electric guitar, acoustic guitar, saxophone, flute, trombone, trumpet, harmonica, banjo, synthesizer keyboard, recorder. This is a great motivational show, and is used by many schools to get the students informed and fired up for joining school band. 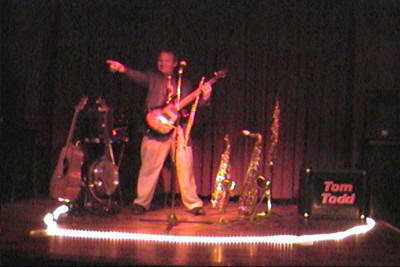 Tom plays popular songs from the 50's up to the present. Songs by Elvis, Chuck Berry, The Beatles, The Rolling Stones, Jimi Hendrix, Michael Jackson, etc., are featured. Where did the name "Rock'n'Roll" come from? How did this new and exciting sound evolve from earlier styles? How did the various artists change the direction rock'n'roll was going? How did the events of the 1960's affect the music, and vice-versa? What was the number one rock song of all time? What were the number one groups? These and more questions are discussed, in between rockin' versions of songs that are timeless in their popularity. A brief section is devoted to the untimely death, due to drugs and alcohol, of many great names in the rock business. Tom sings and plays all the music. With his synthesized back-up music, he sounds like a complete rock band! He demonstrates how a song can be created on the synthesizer keyboard. He gets volunteers up from the audience to try some of the instruments. Featured instruments: Electric and acoustic guitars, saxophone, flute, synthesizer keyboard, harmonica. Finally, after all this talk about the last 40 years, Tom gets the students to 'look ahead' at the next forty years! What kind of music will they be listening to then? Where will they be, what will they be doing with their lives? Altogether it is a rockin', entertaining and thought-provoking 60 minutes that the students will enjoy and remember! Similar to "Introduction to the Musical Instruments" Tom plays on about 10 different instruments, gets the kids to come up and try them, plays popular songs the children know, etc. with a lot more comedy and audience participation. The crowd will 'howl' at the the grand finale "The Knight, The Princess and the Wolfman"! It's non-stop fun with music, that can reward and inspire the students. 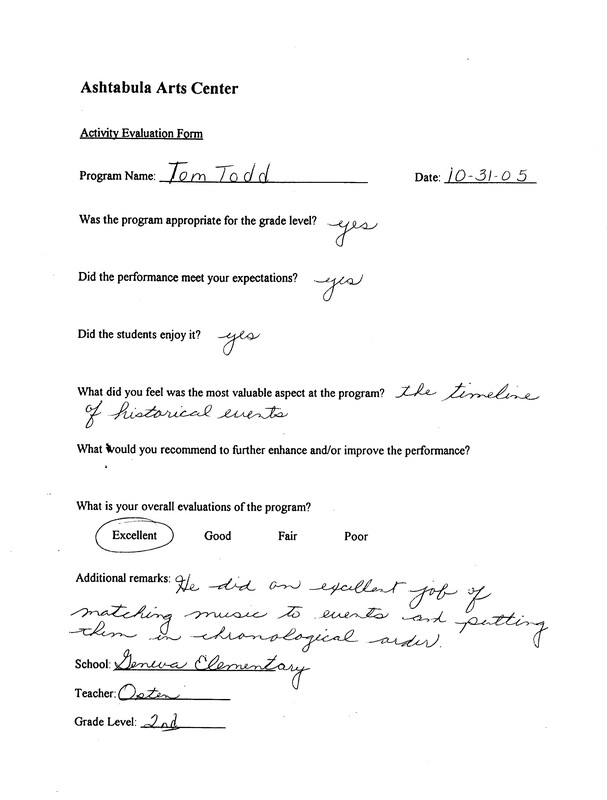 It is possible that Tom can create a show specific to your school's needs. Christmas, end of year, other holidays, Spirit Week, etc. Call and ask. Discounts for multiple shows in one school, or coordinated shows in neighboring schools.